In the Twitter-verse, news spreads fast, is debunked faster, and is retweeted before you can think of something better to say. Gordon Lightfoot can attest to this, I’m sure. It’s important to note that Jackson wasn’t choosing to have an abortion because of an unplanned, poorly timed pregnancy. Well, that had something to do with it. But she also suffers from a health condition that pregnancy could exacerbate, and could at worst lead to death. She wasn’t far along, and in fact, since she lives in the United States she was able to abort with the swallow of a pill — RU 486. In Canada “the abortion pill” has yet to be approved. But that doesn’t make her idea any less powerful, though I’d say that, with the Tim Tebow Super Bowl commercial, there seems to be a lot of “my health required it” abortion stories in the mix these days. Jackson already has a four year old, and she’s known for talking about controversial topics online through her blog and YouTube channel. I think I’ve run the gamut of emotions around this story — the idea is gutsy and daring and a great way to get a firsthand account of abortion, to put a human face on an issue that can travel around the world. But while it might seem like this would inspire debate, the foundations of this project could lead to criticisms of the medium rather than the message. The right to a private abortion is inherent, but does that also make the right to a very public one inherent as well? Jackson is also a fervent atheist — and while that has nothing to do with abortions, it has a lot to do with her reactions to critics who see religion and reproductive rights as one. It detracts from the cause and muddles the language that could further her point of view. But in the end it’s more important to talk than to remain silent. It’s more important to share than to stigmatize. I’m live tweeting my abortion on Twitter — not for some publicity stunt or for attention or to justify this to myself, I am at peace with my decision. 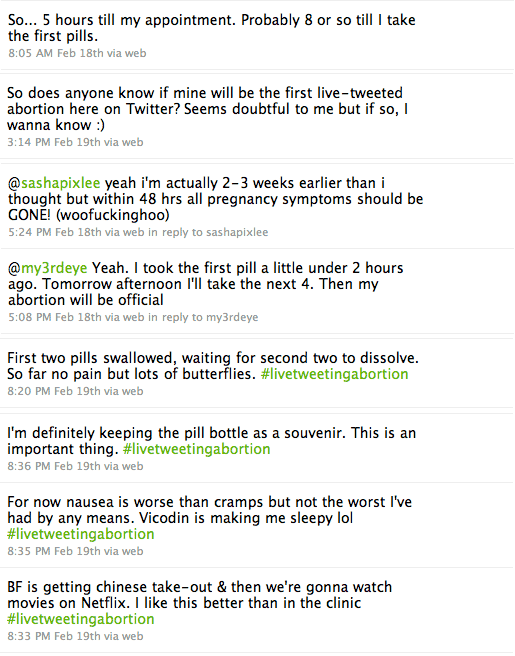 I’m doing this to demystify abortion. I’m doing this so that other women know, ‘Hey, it’s not nearly as terrifying as I had myself worked up thinking it was.’ It’s just not that bad. This is nothing compared to childbirth, compared to labor, or, for me and my risks, late stage pregnancy. Many have noted that women going through a similar situation will find solace in reading or watching her journey, knowing they’re not alone. Her Twitter account has become a digital water cooler for abortion dialogue, and that’s surely a conversation we should be having.